FLINTON — The top seeded Glendale Lady Vikings came out firing in the first two innings, scoring six runs against the three seeded Bishop Carroll Lady Huskies in yesterday’s District 6 Class A softball semifinal matchup. While the Huskies came on late, it was too much to make up, as the Vikings moved on with an 11-7 victory. Brooke Smeal hit a two-run homer in the first inning and added two more RBIs later in the game, while Makenzie Lukehart also hit a two-run homer in the second inning. Glendale pitcher Lexi Mulhollen knocked in a two-run single in the bottom of the first to give an early 2-0 lead. Three batters later, Smeal hit her two-run homer to left-center field. Lukehart then hit a line driver homer to left field in the second inning, also bringing Kristen Hewitt across the plate to give a 6-0 Vikings lead. Bishop Carroll’s deficit was cut in half in the top of the third inning, as Emma Simmons went yard on a three-run homer to bring the Glendale lead to 6-3. 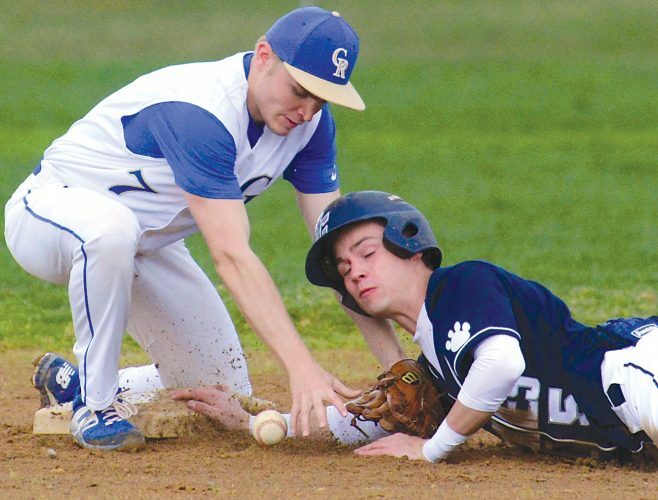 But Glendale poured it on in the fourth inning, scoring five more runs and sending 10 batters to the plate – six of which had singles. “They hit everything that we threw at them,” Boyles said. In the top of the seventh inning, Howard reached with a single with one out. Mulhollen then got Simmons to ground out in a 6-4-3 double play to end the game. “When it came time to respond, I think we just waited a little too long to do that,” Boyles said. Glendale moves to 15-5 on the season and will play Claysburg-Kimmel on Wednesday at noon at Saint Francis University for the District 6 Class A title — a rematch of last year’s title game. Bishop Carroll ended the season at 10-6. Boyles said they will miss its senior core, but looks forward in this year’s younger players stepping up next season. Bishop Carroll (7): Borlie 2b 4110, Howard lf 4222, Simmons p 4113, Clark ss 3000, Divido c 3010, L. Golden 3b 2110, A. Golden rf 3110, Beck 1b 3022, McAndrew cf 3100. Totals: 29-7-9-7. Glendale (11): Hewitt c 3320, Mak. Lukehart cf 4332, Mulhollen p 4023, Hamilton pr 0100, A. Vereshack ss 4230, Reese 2b 3111, Smeal lf 4124, Mad. Lukehart rf 3011, LeMaster 3b 2000, L. Vereshack ph 1000, B. Vereshack 1b 3000. Totals: 31-11-14-11. E–Reese, A. Vereshack. LOB-Bishop Carroll 2, Glendale 4. 2B-Beck; A. Vereshack 2, Hewitt. HR-Simmons (two on, third inning), Howard (one on, fifth inning); Smeal (two on, first inning), Mak. Lukehart (one on, second inning). Pitching: Bishop Carroll: Simmons-6 IP, 14 H, 11 R, 11 ER, 2 BB, 8 SO. Glendale: Mulhollen-7 IP, 9 H, 7 R, 4 ER, 1 BB, 3 SO. WP-Mulhollen. LP-Simmons.